The New Zealand Breakers were too much for the Wollongong Hawks in the first round of the NBL season. The breakers handedly won by a 19 pioint margin 92-73, despite the hot streak Wollongong had in the first quarter with a 28 point first 10 minutes the Breakers held them to only 45 for the rest of the game. The long range shooting of Darryl Corletto 4/5 from long range and the consistent plays from Tom Abercrombie they continually dismantaled the hawks finishing with 19 points each for the game. Rotnei Clark was the highest point scorer for the game finishing with 20 points however the majority of this came in the first quarter where he penetrated into the keyway with ease. 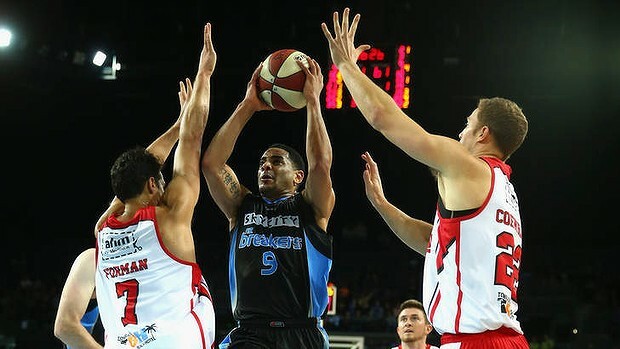 The breakers increased their defence without losing any offensive stregnth after the first quarter and managed to take the lead with a 10 point swing thanks to the hot shooting from Corey Webster and Tom Abercrombie hitting consecutive three pointers. The depth in the bench really showed the difference in these two teams. The Breakers can run full throttle on defence and offence for the whole game due to their talented players and hot shooting from the whole team. This will be the Hawks main deficiency this season as they dont have the talent coming off the bech that some other teams have. The Hawks starting line up is rather impressive when it all works but they dont have enough to fall back on when its not. Hopefully in the next couple of weeks they can find a gun import who can give them some more options as i dont think Clark can carry them for the whole season. Having said that if they find a player that can work well in Geordie McLeod's system i know they can become deadly under one of the best coaches in the league. The Breakers are looking like the championship defenders that we had seen last season and the loss of Cedric Jackson looks to be filled nicely by Kerron Johnson. This blow out victory is a statement to the rest of the league and each team will be ready for a tough battle every time they play the Breakers who are hopeing for the first ever 4 peat in the NBL.